How a centuries-old mathematical sequence can help traders identify entry or exit points in modern markets. What if I told you there is a mathematical progression or series of numbers that could help you predict future price action in financial markets and instruments? The progression of numbers I’m referring to has been known to science for the best part of 800 years and is named after the mathematician that first discovered its existence, Leonardo Bonacci, popularly referred to as Fibonacci. Knowing where or at what values these Fibonacci levels reside on a chart can provide traders with a clear idea of support and resistance levels in that instrument, and the potential price targets therein. Whether the sequence genuinely exists in the markets or is simply projected by market participants is a moot point as long as price action respects these levels which it often does. The use of Fibonacci is most common in technical analysis, where it is often applied to candlestick charts in retracement studies. A retracement is one in which a Fibonacci study is overlaid on a chart on the price action of a significant or meaningful move, spanning the highs and lows of that move. Fibonacci retracement studies work best in markets that have clearly visible trends. Traders can find these moves by identifying the high and low price points within that trend and using those as the starting points from which to apply the retracement study. I have highlighted examples of those high and low points in the chart below. In this case, a weekly plot USDMXN mapping out a nine-week uptrend from start to finish. I have highlighted these high and low points within that uptrend with red horizontal lines. In the example below, a Fibonacci study has been drawn onto a EURUSD 30-minute chart to measure and track the rally in the single currency against the greenback. 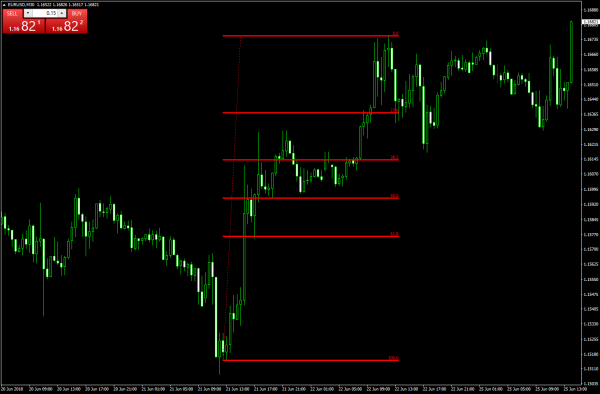 The retracements are drawn between the high and low points in that uptrend. Remember, an uptrend is defined as a series of higher highs and higher lows, while a downtrend is made up of a series lower highs and lower lows. In this example, the study was applied after the event and overlaid onto existing price action. As such, it’s useful in identifying key price points within the rally that may be revisited on any subsequent downturn. These lines can identify support and resistance, as well as potential price targets on a pullback or retracement. If you’re using our MT4 Platform, you can try this yourself – simply find a trend within your chart and drag the retracement tool over it. 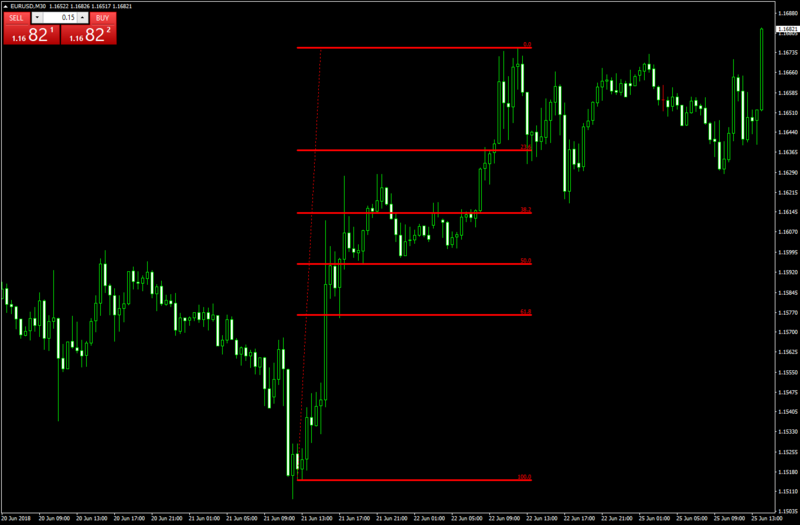 You can find the retracement tool in the toolbar, highlighted it in red in the image below. Retracements are drawn from high to low on a downtrend and low to high on an uptrend and traders typically use Fibonacci retracement lines and levels as entry or exit points, placing take profit or stop loss orders at or around the retracements. For example in the chart above, we can imagine placing a pending buy just above the 38.2% line in anticipation of the EURO breaking above that line, as it did on the morning of June 22nd. 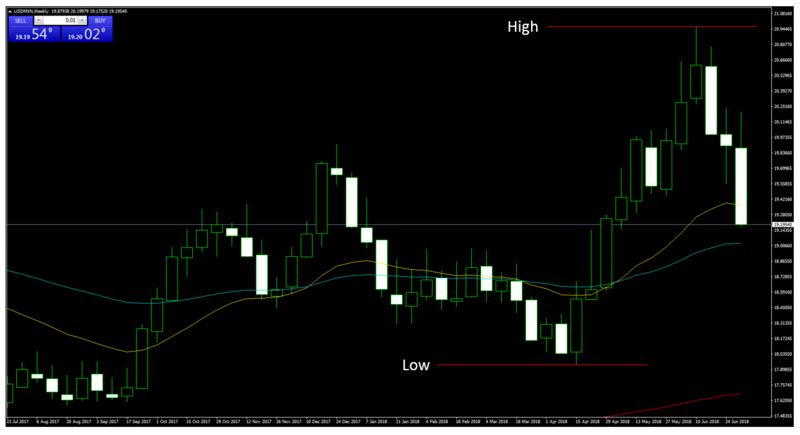 Once in the trade, we might use the 23.6% line as a stop-loss level to close our trade on the subsequent pullback. Fibonacci is rarely used in isolation to make trading decisions. Instead, most traders use it in combination with other indicators. This is because the number sequence tells us little or nothing about the strength or longevity of a trend or counter-trend until it’s over. However, many traders will use the retracement levels to inform their placements of stops and take profit orders or to enter or exit a trade in combination with a signal from another indicator. One example of this might be closing or entering a position if the price is finding support or resistance at a Fibonacci level at the same time as another indicator, such as when RSI 14 was pulling back from an overbought reading or bouncing from an oversold area. In the chart below, a daily plot of GBPUSD, a Fibonacci retracement has been applied alongside the RSI 14 indicator. Note that the retracement completely encompasses the recent downward move in GBP, and further that the 0% line has started to act as support, just as the RSI 14 is trying to move away from its oversold boundary at 30. Traders might look to get long here looking for a rally, using the 0% line or a breach thereof as their stop-loss, while using any move to the 23.6% and 38.2% lines as a place to take profit.